7 Hour Run Time (at 50% Load) - A metal 7 gallon fuel tank for more durability and less refueling. 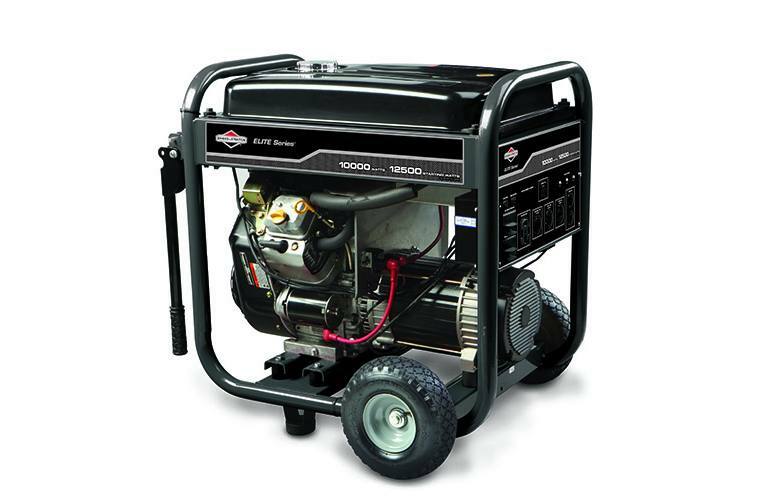 Briggs & Stratton Vanguard™ 18.0 Gross HP* V-Twin Engine (570cc) - The most powerful engine in our U.S. generator line-up, this commercial-grade, easy starting and fuel-efficient V-Twin engine features Overhead Valve (OHV) technology to run cooler and last longer: it’s ideal for heavy-duty portable generators. Easy, All-Terrain Maneuverability - Featuring rugged 10” pneumatic wheels for easy mobility. Heavy-Duty, Multi-Featured Control Panel - Includes 2 – 120V/20A household outlets, 1 - 120/30A locking outlet, 1 – 120V/240V-30A locking outlet, 1 - 120V/240V-50A locking outlet, and 1 - 12V,10A DC outlet for more options on what you can power, even high-wattage appliances. Key Electric Start and Remote Choke - For quick and easy starting right from the control panel.